If your are dreaming about a completely relaxing holiday these 2 luxiorious 2 bedroom villas is what you need to make your dream come true. They offer a set of perfect conditions to make your holiday unforgetable and splendid. First, and the most important - perfect location. 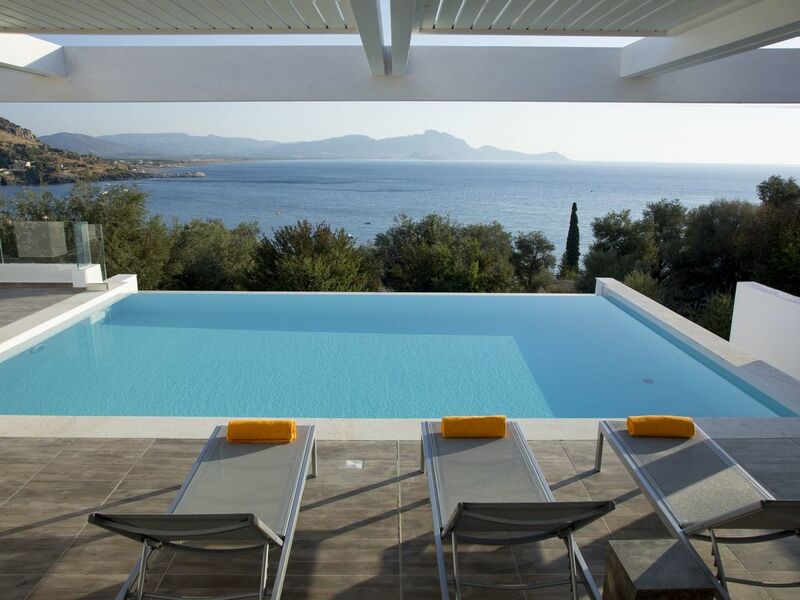 These villas are situated in an elevated position and are offering incredible views of the Aegean sea and Vlycha Bay. At the same time the beach is situated only a short walk away from the villas with lots of cafes and restaurants on your way to the beach. Moreover it takes only several minutes to drive to the historical village of Lindos, one of the most popular attractions of the island. Second, these completely new villas, finished in August 2014 were constructed and designed to make them perfectly suitable for a relaxing holiday. The villas are on two floors, each has 2 bedrooms (one twin bedded and the other large double bedded) and there is also adittional sofa bed in the living area that makes it possible to accomodate up to 4 people + 2 children or 5 adults at the same time. Each comfortable and spacious bedroom has a fitted wardrobe and there is a luxiorious en-suite shower room in each. One will enjoy spacious and light living areas with high ceiling and large windows overlooking the Vlycha bay and own gardens filled with different plants and unique olive trees. Large patio doors both in bedrooms and in living areas were especially designed to let the daylight in and let the guests enjoy astonishing sea views all day long. The open plan living areas include morden and comfortable kitchens equipped with all contemporary quality appliances and spacious sitting and dining areas. Third, outside each villa there is one more place for ideal relaxing holiday - extremely spacious, perfectly planned terrace decorated with wood with private 8 meteres* 5 metre swimming pool with relaxing sun-loungers. BBQ area with built-in, cushioned seating areas dining table and chairs perfectly positioned near BBQ - that's the best place to pass the whole day relaxing and enjoying al fresco meals, swimming and sunbating or just meeting incredible sunrises and sunsets with a glass of famous greek wine. Near Sunset villas 2 Sunrise villas are situated and together they form a complex of villas with their own parking area. Due to it's ideal location near Lindos the complex of Sunrise and Sunset villas may attract the tourists getting married on Rhodes island or looking for a place for wedding ceremony. According to the individual requirements you may reserve up to four villas at the same time and forget about the stress of organising the extra accomodation for family and friend or arranging of transportion between villas. Reserving 4 villas will allow you to allocate up to 20 guests at the same place. Due to their ideal location and astonishing sea views these luxiourious villas will allow just married and their guests to totally unwind and enjoy the tranquility of the surroundings witout any disturbance. There is free air-conditioning and Wi-fi connection in both villas and a purpose-built shower cubicle is conveniently sited close to the pool and seating areas. There is also a room with separate WC leading off from the kitchen area. White towelling robes are available for guests to use during their stay. An outside, purpose-built shower cubicle is conveniently situated close to the swimming pool and seating area. Lovely villa. V well equipped and appointed with quality fitments and accessories. Good location close to small shop, beach and restaurants. Beware short but steep hill up. Some noise from big hotels on hill beside us but not too bad. Superb views. Ekaterina really quick to respond to queries and very helpful. Overall highly recommended. ( Parents beware pool is right outside kitchen so children will need careful supervision at all times). Beautiful villa, lovely furnishings and the outside space was fabulous. Amazing views. Had a wonderful holiday. The booking process was easy and Ekaterina was very helpful and always got back in touch whenever I asked a question. The villa was beautiful, the location was so peaceful with stunning views. A small supermarket 5 minutes walk away and the local beach is lovely too. We got a taxi every evening to Lindos or Pefki for dinner. Also hired a car for 3 days (Rodos Cars) who dropped it off at the villa for us. We went to St Paul’s Bay one day which was charming, had a lovely lunch at the restaurant there (you have to paddle to get to it). The next day we went to Agathi Beach. A lovely golden sandy beach with lots of sun beds and 3 cafes. Very unspoilt. Overall the whole holiday has been wonderful and we would definitely come back. We were delighted with our stay at Sunset Villa one. We arrived late at night and were met by a member of the local hotel team who manage the apartments. The villa is fairly compact with two decent sized bedrooms but you don't holiday in this villa for the indoor space, it is all about the outside and what a space it is. The large seating and dining area (with BBQ) is spacious with plenty of room to spare. And of course the stunning infinity pool with amazing views of the bay. You will never tire of the view. We hired a car but only used it for a couple of shopping trips as there are two good restaurants only a couple of minutes walk away from the villa. Just be prepared for the steep walk back up the hill after! For beach lovers, you should know that the beach at Vlycha bay is stony and not sandy so we rarely used it. Overall this is the perfect villa for a relaxing break away from the crowds. I would not hesitate to return. We have just come back from the amazing sunset villa 1. The villa was beautiful, private and very well maintained with a huge garden to the front. Everything from hairdryer to pool towels and lots more besides was provided. The views over Vlycha beach were stunning and the pool fabulous. There really were no down sides to this amazing villa and it's location, which was only a couple of minutes walk down a steep hill to the beach, but hey you wouldn't have the views otherwise. We had a lovely welcome from the director of the Lyndian Jewel hotel who showed us around the villa and provided an excellent welcome box of provisions to get us started. We had a wonderful time here and were sad to leave! -excellent service provided by the managing agent which is the nearby Lindian Jewel Hotel. - stunning view as you lie, eat and swim in the pool. This comes with a price which is a very steep hill leading up to the road where the villa is located. - centrally located, the hotel restaurant provided excellent and reasonably priced meals with other restaurants and bars nearby. Lindos is a short 12 euro taxi ride away. - spotlessly clean, spacious, well equipped villa with everything needed plus effective air conditioning! - would recommend car hire. We used M&S car hire, based in nearby Haraki, who collected us from the airport, left a car outside the villa for us and returned us to the airport at the end of our week -fantastic and friendly service. We had a fantastic week in this beautiful villa. We were met on arrival, made to feel welcome, given a tour and had any essential info explained to us. The villa is in a superb location, with some lovely local restaurants and a small supermarket for essentials at the bottom of the hill on the beach. There is a larger supermarket a short drive away. We hired a car which meant we could make the most of the fantastic restaurants in and around Lindos, which is no more than a 5 minute drive up the road. Vlycha beach is vast and did not appear too crowded, though we never ventured down to spend time on the beach, having all we needed in the villa, and the stunning views. There is also a beautiful, large private garden down the steps. The villa is extremely well equipped, and very comfortable. We loved it so much we are going again next year ! The villas are situated just a few minutes drive from the historic village of Lindos with its beautiful whitewashed houses and narrow streets. If you are looking for original jewellery or handmade sandals and clothes and many other interesting souvenirs you should visit this place. You should also relax in one of it's famous roof top restaurants or cafes. There is a range of beaches for any type pf tourist near Lindos – the main beach is sandy with plenty of sun-beds and umbrellas that are arranged in front of the sea. Opposite the main beach, the Pallas beach also sandy and there are lot of tavernas there where you can enjoy refreshing drinks during a hot day. On the other side of Lindos village you will find St Paul's Bay which is great for snorkelling in its crystal water. As well as being located within minutes of Lindos, the villas overlook the beautiful Vlicha beach which is within easy walking distance. The beach has great water-sports facilities and there are tavernas in which to enjoy lunch or an evening meal. Perfect for swimming, the water at Vlicha beach is very clean. The villas enjoy the most incredible sea views from their elevated position overlooking Vlicha Bay and these are probably most enjoyed in the evening after a day on the beach, or site-seeing, when you can enjoy a drink on the terrace and breathe in the amazing scenery. A good supermarket is located not far from the villas, just off the main road, and offers a very good selection of everything that you will need, including fresh bread, vegetables and meat. It is called Flevaris Supermarket. If you would like to experience some very traditional Greek villages, you should also visit Pilona or Lardos that are only several kilometeres away from here. You can visit beautiful churches, medieval fortress. Every day you will be able to find something new to visit and see. Another lovely day out is to the famous Butterfly Valley. This is particularly recommended in August when the trees are completely covered with butterflies and you'll be able to relax in the shadow of the forest. The villas are ideally located for the local attractions and those available throughout the island. Their position also offers the most magical of settings. Car is highly recommended to have the possibility to visit the main attractions of the island.